We’ve given our CRISPR Plasmids and Resources a fresh new design, sorting the plasmids we have available by category. Each plasmid page now has a helpful graphic to introduce you to the plasmid class covered on that page. 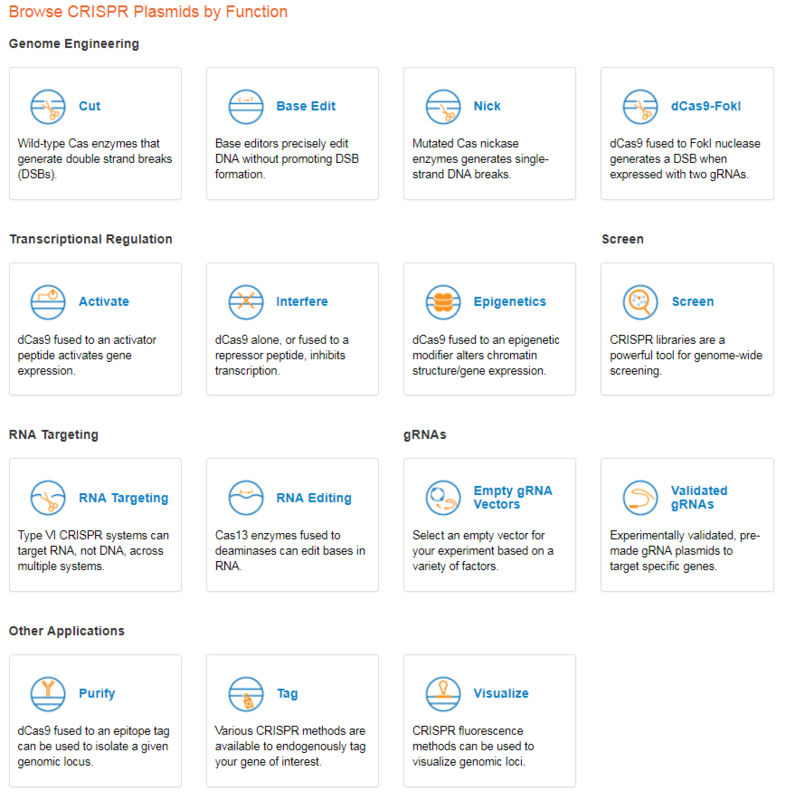 To help you find popular plasmids, we’ve also added four new plasmid pages that cover some of the hottest CRISPR tools. Base Edit: Base editing plasmids allow you to make precise C:G->T:A or A:T->G:C edits in DNA without causing double-strand breaks. Our new page shows you base editing plasmids for mammalian systems, bacteria, plants, and yeast. Popular cytosine base editor pCMV-BE3 has been requested nearly 400 times, and newcomer pCMV-ABE7.10 has already earned a blue flame for its adenine base editing capabilities. Epigenetics: CRISPR has made it possible to design programmable epigenome editing tools, and the field has certainly taken notice! Our newest page in the Transcriptional Regulation category already has five blue flame plasmids covering three different epigenetic effectors. The diversity of tools is especially exciting, including histone acetylation by p300, histone demethylation by LSD1, cytosine methylation by DNMT3A or MQ1, and cytosine demethylation by Tet1. RNA Targeting: This page contains Cas13 constructs for mammalian and bacterial systems. Plasmids with wild-type Cas13a (formerly C2c2) can mediate targeted RNA knockdown, which leads to unique non-specific RNA cleavage in bacteria. In mammalian systems, Cas13a degrades only the specified RNA target. Bonus: It displays similar on-target activity to siRNA, but with far fewer off-target effects! This characteristic probably explains why pC016 - LwCas13a guide expression backbone with U6 promoter has already earned a blue flame. RNA Editing: Did anyone predict that we’d be able to edit RNA in mammalian cells with CRISPR? I certainly didn’t, but now we can with Cas13b/ADAR constructs from the REPAIR (RNA Editing for Programmable A to I Replacement) system. Like RNA targeting systems, RNA editing does not make changes to the genome, thus providing an avenue for temporary/reversible CRISPR modification. In addition to these subpages, our updated CRISPR Guide and CRISPR History provide a great overview of the development of CRISPR into a varied research toolbox, as well as additional resources to help you Plan Your Experiment. We hope you enjoyed the #12DaysofCRISPR, a celebration of our updated blog resources. Not on social media? No problem - see our recap below!